The internet and the economic downturn have not been kind to the nation's postal system, but it's also been burdened by problems that were, and are, completely avoidable. I, and other postal commentators, have spilled a lot of ink (and pixels) explaining how billions of dollars have been needlessly taken from the U.S. Postal Service to overfund its pension and retiree health benefits. 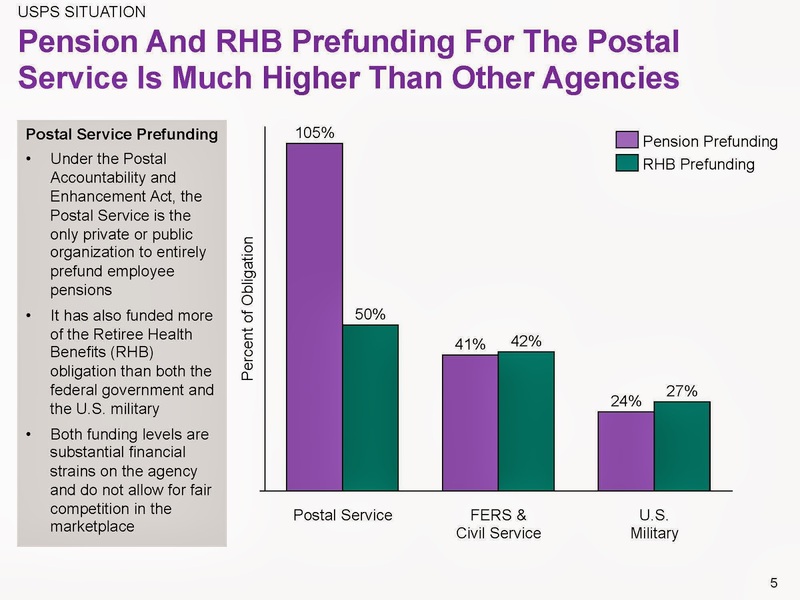 The chart above from Rafe Morrissey of the Greeting Card Association shows clearly that USPS's payments are way out of line with what's typical for government agencies. "Both funding levels are substantial financial strains . . . and do not allow for fair competition in the marketplace," says the slide, which is taken from afree webinar that Morrissey is presenting tomorrow (Oct. 9, 2013, 2 p.m. Eastern, 8 a.m. Hawaiian) called "A commonsense solution to the postal service's budget crisis." Morrissey, the GCA's Vice President of Postal Affairs, will present the association's plan for reviving the Postal Service, which advocates nationwide implementation of cluster boxes and adopting a host of other changes while preserving Saturday delivery and avoiding above-inflation rate increases. For more information on the Postal Service's pension overpayments and "prefunding" of retiree health benefits, see Congress Hears the Truth About Postal Service Finances, which describes the USPS Inspector General's rather forthright Congressional testimony on the subject. Yet another measured and concise assessment of why Congress is playing dirty politics with the Postal Service: their demand that USPS contniue to pre-fund its health-care benefits. STATEN ISLAND, N.Y. -- The cost of a first-class U.S. stamp last increased on Jan. 27, rising by a penny to 46 cents. Now, just eight months later, the U.S. Postal Service is seeking another hike. The USPS, awash in red ink, has made an emergency request to raise the basic rate to mail a letter to 49 cents. A lot of people will direct their outrage over the hike at the USPS. But blame Congress, not the post office, for the crisis. “We did not want to take this step, but we had no choice due to our current financial position,” Postmaster General Patrick Donahoe told lawmakers on Capitol Hill. It’s no wonder. The United States is one of only two nations in the world that don’t fund mail delivery. The other is the lawless rogue nation of Somalia. As an independent federal agency, the USPS is subject to congressional control. But it receives no tax dollars for its day-to-day mail operations. To pay its way, the Postal Service has to rely on the sale of postage stamps and other products and services. It borrows money from the Treasury Department as a last resort. The USPS expects to lose a total of $6 billion this year; in 2012, the agency lost $16 billion. Declining mail volume due to the rise of e-mail and texting isn’t the key problem. Nor is competition from private package deliverers such as FedEx and UPS. Moreover, management and labor have both worked to boost postal productivity and cut operating costs. The controversial decision in 2012 to shift local mail-sorting from Staten Island to Brooklyn is a typical example of the effort by the Postal Service to cut costs. Since 2006, the USPS has reduced annual costs nationwide by about $15 billion and cut its work force by 193,000, or 28 percent. What remains year in and year out is the mistrust of big government and big labor among hard-line conservatives in Congress. Their opposition to reasonable federal subsidies for mail service is why the USPS is going broke. Back in 2006, during the Bush administration, the then-profitable Postal Service was burdened with a crazy requirement. Congress decided the agency was to begin pre-payment of 75 years’ worth of anticipated health benefits for future retirees, including all those who had not yet even been hired. No other public agency is saddled with this impossible requirement. But Republicans were worried that a potential collapse of the Postal Service would lead to a hugely expensive bailout by the federal government. Now the USPS is seeking to reduce its required $5.6-billion annual payment for future retiree health benefits. It deferred one of those installments in 2011, missed two in 2012 and another has just come due. Even John F. Hegarty, president of the National Postal Mail Handlers Union, believes the fiscal woes of the USPS are based on these excessive health-care payments. “Most losses in the last few years have nothing to do with the failed business model or the obsolescence of postal services,” Mr. Hegarty said, faulting the benefits funding. Before Congress turns to proposed cost-cutting steps such as ending Saturday mail delivery or regular door-to-door service, it should ease the burden of pre-funding of USPS health-care benefits for decades to come. It’s time for lawmakers on Capitol Hill to stop playing politics with the U.S. Postal Service. Great Op-Ed piece from Robert Ehlert of the Idaho Statesman on why saving the Postal Service is the right thing to do. "Wake up, Congress", indeed. Ever since the word “trillion” entered the government debt conversation, a paltry “billion” seems like chump change and a “million” as insignificant as a penny at a parking meter. So, when we mention that the U.S. Postal Service lost $16 billion in 2012 and so far this year has lost only $4 billion to $5 billion through three quarters in fiscal 2013, you can put this into the proper contemporary perspective. I am quite fond of the Postal Service. Besides having beloved family members and friends who have served it, I understand the importance and context of the tradition and the very building — especially in smaller, rural communities in Idaho and beyond, where the post office is a gathering place and landmark. I don’t get nearly as excited about getting an email as I do about getting a handwritten letter or the occasional package bursting with foam peanuts. If I want to send a box of rocks across the country, I grab a Priority Flat Rate box, stuff it and ship it off for $10 to $15. That said, the USPS is in big trouble. Its traditional business model is evaporating, losing out to technology just like the Pony Express succumbed to the telegraph 153 years ago. A new generation thinks it has little use for the Postal Service. Parcel Post seems to have the edge on online shopping/shipping sprees. As if the free marketplace was not being cruel enough to the USPS, Congress a few years back decided to demand that it prefund health care expenses for those who will eventually enter its pension system — something most other federal agencies don’t have to deal with in the same way. About half of the Postal Service’s red ink can be attributed to having to make those pension payments. According to a statement issued last month from Postmaster General and CEO Patrick Donahoe, the Postal Service won’t be able to make its Sept. 30 health care/pension payment of $5.6 billion or the $1.4 billion it owes the Department of Labor for workers’ compensation. It can’t borrow money. Try as it might with technological initiatives — digitally tracking packages, selling postage online and making greater use of computers and databases — the Postal Service is losing more and more ground to the sands of time. There is a Five-Year Plan to save $20 billion (read it here) by 2017 by increasing package service and dropping Saturday delivery, but Congress is going to have to vote to restructure the USPS. There are bills in the House and Senate to accomplish this, but that seems like back-burner matter to the Syrian crisis, the entire government’s financial peril (funding runs out Sept. 30) and debating when and how to raise the debt ceiling in October. The USPS wants to start acting more like a business, but laws prohibit many of its Big Ideas. If, for instance, the USPS could begin shipping alcohol (now forbidden), the wineries, breweries and spirit-makers all over the West and Northwest could cash in on new and hard-to-reach customers. Imagine if Sockeye beer and Idaho wines could make their way to “I” states such as Iowa, Illinois, Indiana and other places not known for suds and Syrahs. Of course, this would require legal interstate cooperation and some regulation, but it is possible. One of USPS’s biggest liability expenditures — besides labor, which is 80 percent of costs — is that it has to deliver everywhere. But that could also be an asset. I’ve always wondered why the people who run the Census Bureau and the USPS can’t work out some efficiencies every 10 years during the regular Census, and in off years when the American Community Survey is circulated. The Postal Service knows where you live. Its workers drive or walk by nearly every day. What else could they be delivering? Open your eyes and ears, Congress. If you’re not going to close the USPS down, then get this restructuring deal done and get to work on some new mail routes to the future.